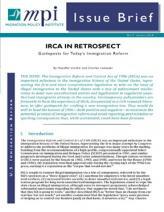 The Immigration Reform and Control Act of 1986 (IRCA) was an important milestone in U.S. immigration history, representing the first and most comprehensive legislation to take on the issue of illegal immigration to the United States. This policy brief traces IRCA’s successes and failures, making the case that its major flaws were rooted in statutory design more than regulatory challenges and implementation by the administrative agencies. The brief examines the results, intended and otherwise, of key border and interior enforcement provisions in the legislation, as well as gaps regarding the use of fraudulent documents, increased employer outsourcing, inadequate labor protections, and collateral impacts such as on wages and working conditions. The brief also assesses two IRCA legalization programs—a general legalization and Special Agricultural Worker legalization—finding them the most successful part of the law’s implementation. The authors argue that IRCA, like all major legislation, was based on imperfect knowledge of the conditions it sought to address, limited understanding of how the law would play out, and it faced implementation challenges—all of which diluted its effectiveness. Although the law deserves to be recognized as a historic piece of legislation, its shortfalls have contributed to today’s dilemmas in U.S. immigration policy.